Made another barrel evaporator. It's in the R&D stage right now but fired it up today to check draw and efficiency. Not perfect but does not really have to be, a little fine tuning and putting it in it's final home will help button up most of the minor issues left to deal with. 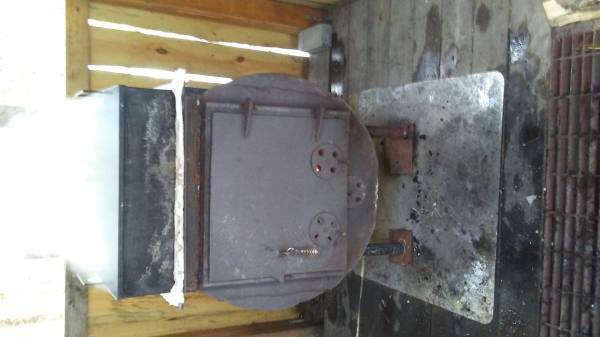 Made from an under counter hot water heater inner shell,large bolt for the handle, door hinge, two fireplace wood holders, vent pipe and it's all nut's and bolts holding it together, for now as it passed the first test and I will make things a little more permanent. 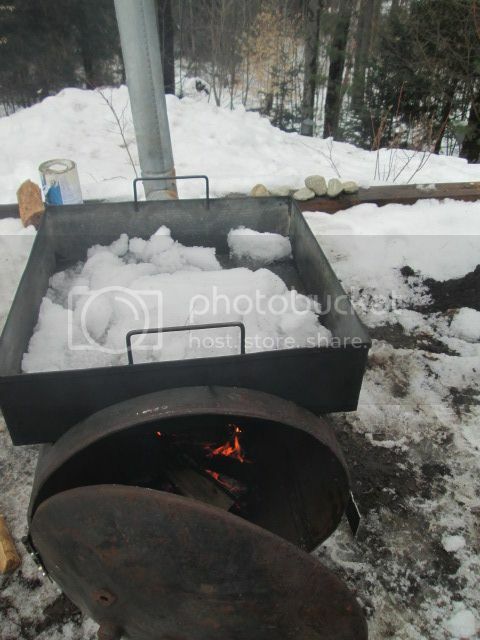 The boiling pan is almost twice my age over 50 years old, hand made by a local and passed down over time. Last edited by NHscrapman; 03-27-2015 at 01:37 PM. The air pressure is low today so it might not be drawing as well as it would on a sunny day. You could try a small fire in the back of the stove to get it started. The chimney might draw better once it's up to full operating temperature. If all else fails ... cut a wye into the chimney and install a fan as a draft inducer. You could always install a gun from an oil fired furnace on the front door. That would make her burn good too. Sorry ... don't mean to be a downer but you might want to check the evaporator pan to see what it's made out of. For food safety you really ought to use either stainless or copper. It is indeed a very simple sap evaporator setup. Good eye on the pan, dead on, old galvanized and lead solder it's a relic more than anything. I have two SS pans one that fits this stove and my old stove and a much larger 5'x3' one who's time may or may not come...we'll see. It's already cleaned up for the start of the season (this week most likely) kinda a slow start but it's running real well now with the moderate temps. I was thinking .... it's in the R&D stage so you're still tinkering ? 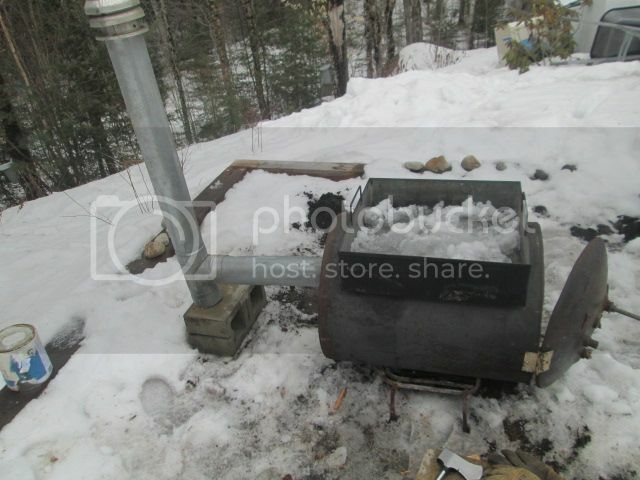 You might move the chimney outlet on the evaporator up near the top like what you see on a woodstove. The smoke (flue gas) is hot so it naturally wants to rise to the highest point. If you just let it do what it wants it will create a vacuum and pull in fresh air from the door. You might want to run it outdoors till all of the galvanized on the outside has burned off. I saw the stuff listed as a hazmat that welders have to watch out for when welding metal that's been galvanized. Probably won't do much harm if you burn it off outdoors but if you installed it inside a building that stuff might make you sick. Just a crazy idea .... have you thought about a Vogelzang barrel stove kit ? I saw one new on e-bay last night for about 40 bucks plus shipping. I think they even have grates that you can buy. On the one hand it takes all the fun out of tinkering. On the other hand it's a time tested design that you could put together in a couple of hours. Maybe you could modify the design and weld in a stainless evaporator pan to the top ? I hear you about the sap. It's almost all softwood here where i am but the trees are still frozen. Was walking out through the woods last week on a windy day and you could hear them cracking & popping like crazy. It's a wonder that they didn't break and fall over. Better days are coming ! Won't be too much longer now. Yes I completely agree with trying to get the stove pipe as high on the stove as possible. Anyone trying to build one of these should do just that IMO... that's just good advise. In my case... which is usually the case...lol, that was thwarted by not only enough room on the top for both the pan and stove pipe, but also a inward concave on the backside. The space between the bottom of the pan to the back wall is around 1/2 inch of space...pretty tight I thought? The top of the pipe is lined up right at the bottom of the pan. From what I have gathered there is adequate draft due to the pan taking up almost all available space up top but not enough air intake to keep the fire going with the door closed. It would smolder out but the smoke was 99% coming out the stove pipe. I plan on adding more vents to the bottom area of the door to increase the air intake perhaps a sliding cover to control it as well. 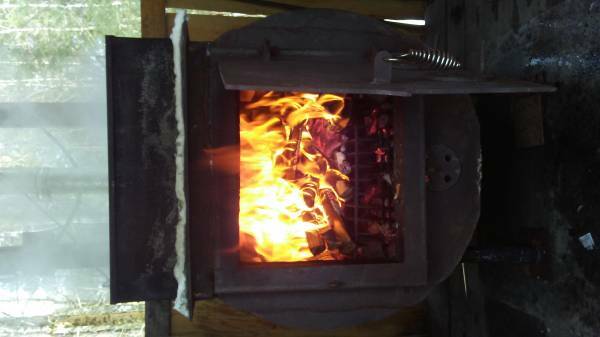 My father runs an actual wood stove that he torched out the top and has an insert pan like mine. He needs to run with his door cracked to keep enough air coming in to keep the hot fire needed for boiling. As far as putting it inside.. the "shack" is a simple three sided structure with a metal roof. Not air tight in the least basically a place to get out of the elements off the ground and cover the evaporator from ash and debris. Maybe 1 foot of pipe inside the actual structure, but again, point well taken. I enjoy tinkering on my projects, no rush to get it all perfect, it's working at the cost of a little torch fuel and a saws all blade. I chose this barrel because the steel is a little over 1/8'' thick and can withstand the long boils much better than a 55 gallon drum... IMO... taking the good with the bad I suppose. My boiling pan will not be welded to the stove, I use them as an insert piece. there is the door latch catch, door handle, hinge, support base and inner grate all need to be welded into place. Although..... welding on the boiling pan means you need some sort of drain system to get the unfinished syrup into your finishing pan.... could be a simple shutoff.. there are endless ways to play with these. I had my stainless pan made to mimic the old style pan. It will fit on a 4 burner stove but also large enough to put over fire without constant adjusting but small enough to pick up and dump out. Last edited by NHscrapman; 03-28-2015 at 07:19 PM. I wanted to add I tried to use a standard sized water heater tank but they are too shallow for an insert type pan the way I cut them in. they need to be built up to hold the pan. 55 gallon drums offer a little more room for the fire. This one is a bit wider than a 55 gallon drum and has plenty of room for the grate, fire and air/smoke space. 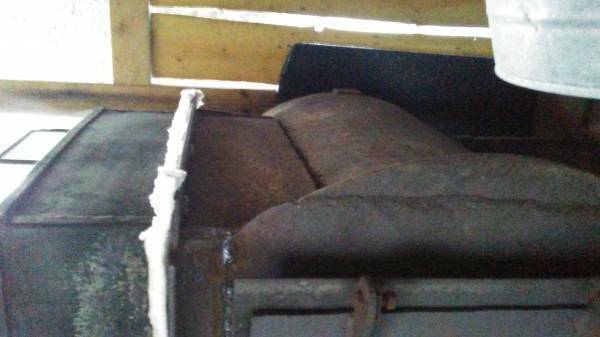 Booted that primitive evaporator out of the shack, not a bad go . Now I have started building a real evaporator. Right now it is just the front, I will be using the angle iron I scored to extend the back 6ft. The more surface area the faster evaporation rate the more maple syrup I can make in the same amount of time. Last edited by NHscrapman; 03-12-2018 at 05:59 AM. 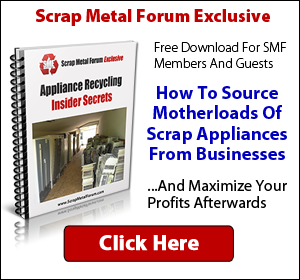 I'm into science/ organic chemistry as well as scrapmetal recycling. I guess this ideas not 'A simple evaporator' and more like 'A xxxxxx complicated evaporator'. But, in chemistry they use a rotary evaporator and can add a vacuum to it to lower boiling points to room temparture. A rotary drum would work, doubt it there's a chance of using vacuum though... No condensers needed for vapors in this case either. You would like the new 3\16 lines, it's a closed system of tubing that creates vacuum using gravitational resistance. Sap and air (tree gas) in a tube pulling 24" of vacuum. Pretty cool to see it work it can pull the liquid slightly uphill and from a introduction point lower than itself ( tapping below the tube), there are also sap ladders which allow sap to ride bubbles of air several feet upwards in the tubing. I need a simple way to list on E bay !!!! is there a simple fix ?